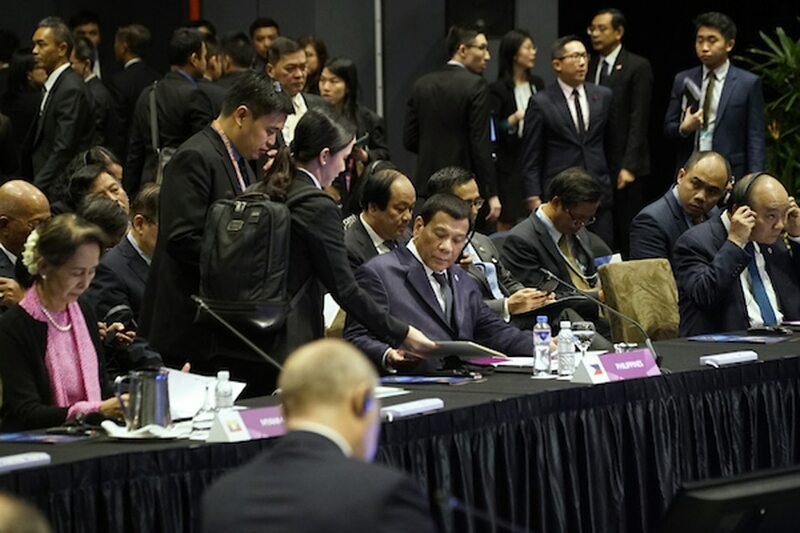 MANILA - President Rodrigo Duterte on Friday again defended his absence in some of the meetings at the recently concluded Association of Southeast Asian Nations (ASEAN) Summit in Singapore. Speaking to the Filipino community in Papua New Guinea, Duterte explained why he did not attend the ASEAN-Australia “informal breakfast,” the first event of the summit’s second day, scheduled at 8:30 a.m. last Wednesday. “Itong Australyano di ko maintindihan. Ang invitation eh ‘informal’ breakfast...Unang una hindi ako kumakain ng breakfast... Pangalawa, informal. Ano ipakakain nila sa atin? Kangaroo?” Duterte said in jest. The President has been criticized by opposition figures for missing some of the meetings attended by world leaders at the annual summit. Malacañang has come to Duterte’s defense, explaining the chief executive needed to take “power naps” after dealing with a grueling schedule. Aside from the Australia meet, Duterte also failed to attend the ASEAN leader’s meeting with officials from South Korea and a working lunch with Singaporean Prime Minister Lee Hsien Loong. Duterte also skipped the Regional Comprehensive Economic Partnership Summit and the gala dinner. Trillanes, Duterte's fiercest critic, said the President's naps can either be indicators of his health condition or supposed laziness, noting that it's a "big problem" for the Philippines. Presidential Spokesperson Salvador Panelo said the chief executive’s absence in some of the meetings had minimal implications, noting that all the latter had to do was just read statements, a task delegated to Foreign Affairs Secretary Teodoro Locsin Jr.
Panelo added that Duterte was not only the world leader who missed some of the meetings. “Their absence in those meetings did not make them lazy or seriously ill to perform their duties as Presidents of the their respective countries,” he said.